Stage 1: False confidence. 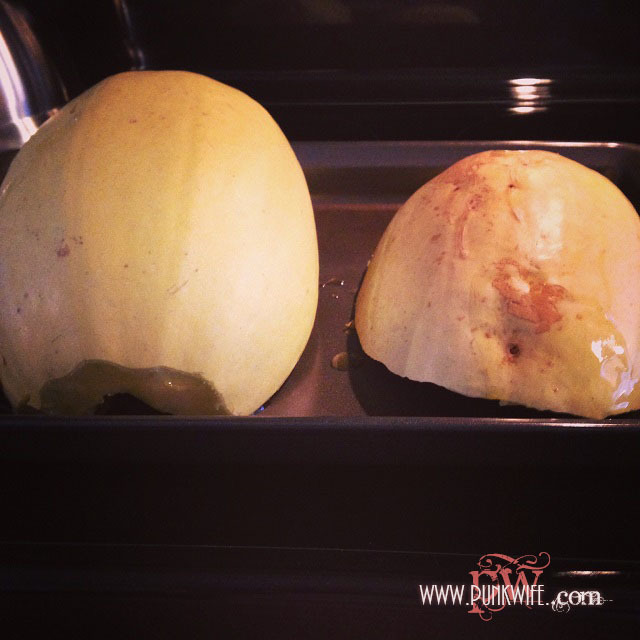 I’m going to make spaghetti squash because it’s Fall and I’ve never done it before. It’s all up in my Pinterest boards and I’m ready to find out what the hype is all about. 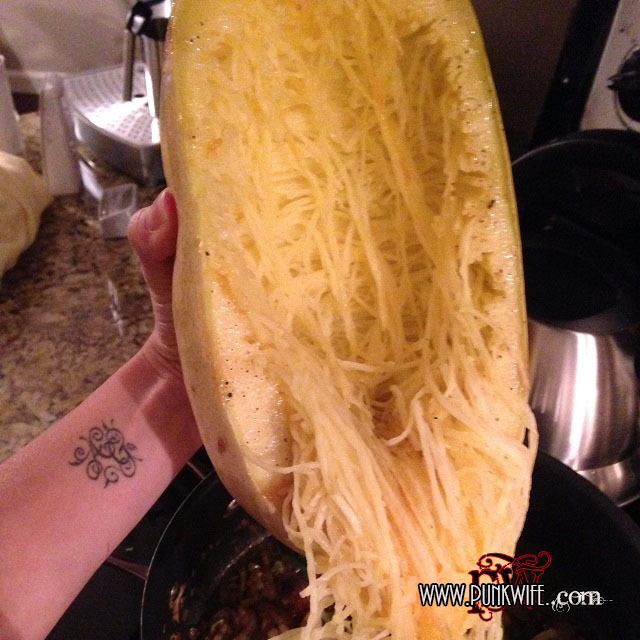 I’ve thought about cooking spaghetti squash before. I see them staring me down while grocery shopping, all yellow and oblong-looking, judging my preference for other vegetables. I will be taunted by this strange seasonal vegetable NO MORE. 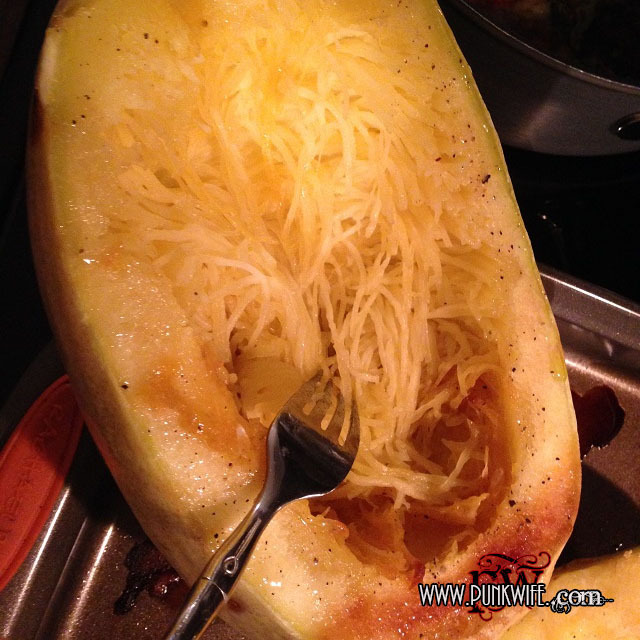 You asked for it, Mr. Spaghetti Squash. Mama’s feeling like pasta and she’s on a low-carb kick. It’s on. This will be a breeze. Stage 2: Naive gusto. I’m just going to slice this sucker in half. Yep, just like — er — ooomph! — how do I cut this thing open?! And what the heck do I do with it? Ok let’s see…slice off the top, take a little off of the bottom to make it flat, stand it up, and then dowwwwwn the middle. Easy does it. Ah, okay, NOW we’re rolling! I cut it perfectly in half, just like Martha told me to. Stage 3: Relief. Now, for the easy part! I’m going to sprinkle some salt and pepper on this bad boy and drizzle some olive oil, and roast the juices right out of it. Set my oven to 375, and my timer for 35 minutes. Annnnnd, done! Mmm, that smells great! Easy peasy! Stage 4: Panic. 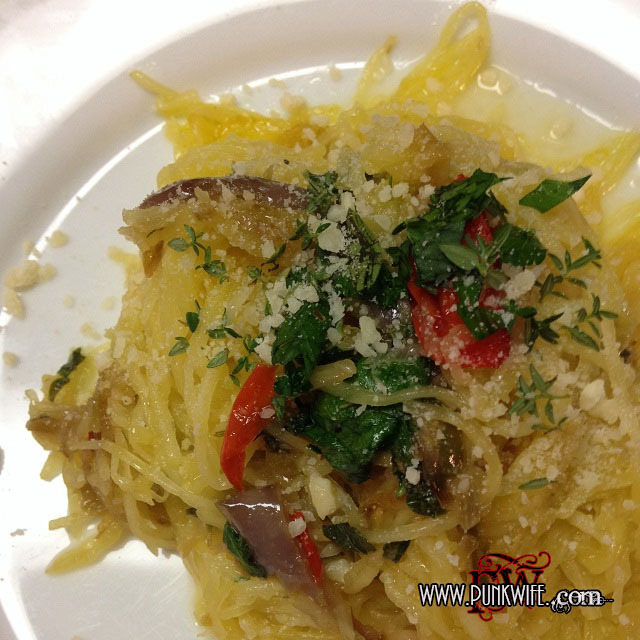 Wait a minute – where’s the spaghetti? What kind of sick joke is this?! Stage 5: Regret and uncertainty. Maybe I bought the wrong vegetable?? I mean, there were so many strange looking gourds and I don’t know what happened…So much pressure! Stage 6: Hope. Wait, let’s be reasonable first and do the only thing we know how to do when facing a culinary crises: search Google. Google says I’m supposed to use my fork to scrape the flesh and that it should — wait — OHHHHH, there’s it is!! I’ve hit gold!!!! Stage 7: Euphoria. IT’S BEAUTIFUL!!!! So many golden threads! I never want to cook regular spaghetti again! Stage 8: Panic (again). OMG why won’t it stop? Whywon’titstopwhywon’titstopwhywon’titstop! Stage 9: Relief. Phew, there it goes. Now, to dress it up! I’ll toss it right in the pan with some roasted peppers, shallots, and butter. Stage 10: Satisfaction. THIS is what I’m talking about! 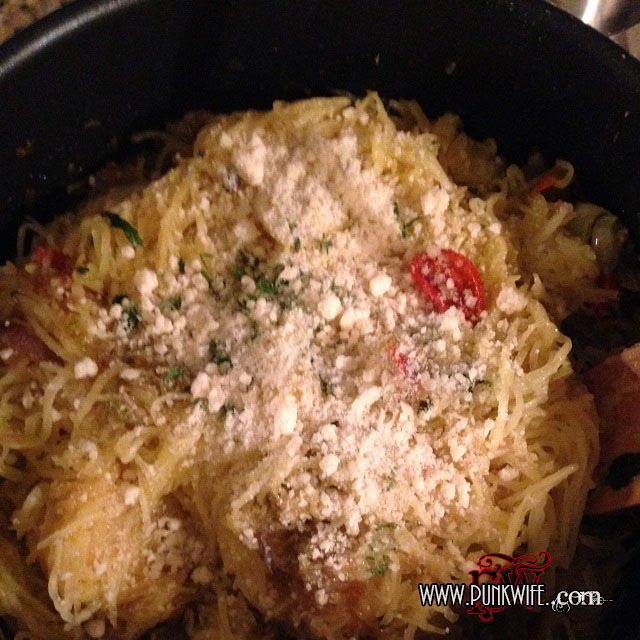 Top it with some fresh herbs, some Pecorino Romano cheese, and serve. And now, for my recipe! Heat butter in a large, deep skillet over medium heat. (A medium-sized saucepan will work as well.) Add shallots and cook until soft and translucent, about 4-5 minutes. Add the pepper and sautee until soft, stirring occasionally (12-15 minutes). Add the sherry to the pan, and cook until the sherry burns off (another 5 minutes or so). Reduce the heat to low. 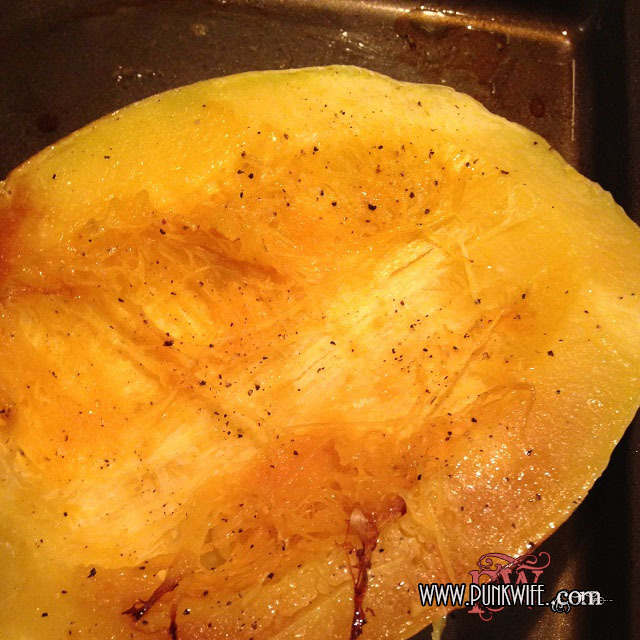 Once the squash is cool enough to handle, using a fork, scrape the insides out. You should see the flesh flaking off into golden thread-like pieces. This is your “pasta”. Scoop it directly into the pan with your peppers and shallots. Add the herbs and cheese, gently toss, and serve! next article: Contest Giveaway: Gorgeous Montage Photo Book! Funny article Al!! It looks gorgeous and quite delicious but how did it actually taste?!?!? 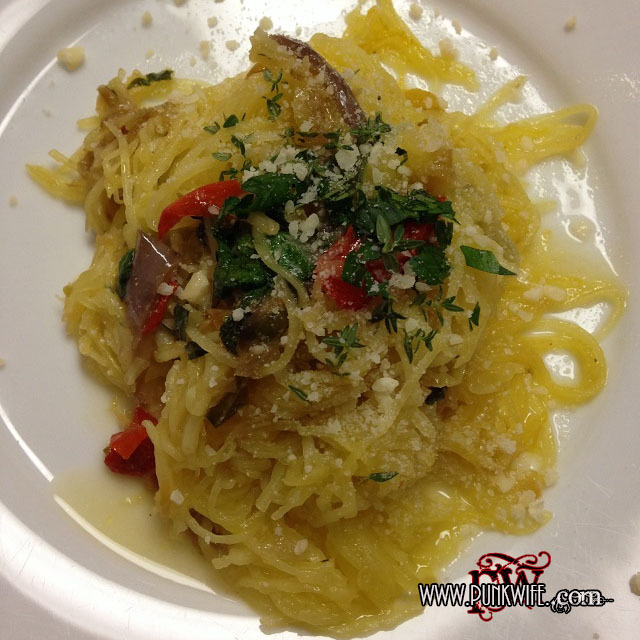 I’ve been wanting to make spaghetti squash myself!!! Thanks Nicolette! It was actually very good! Not heavy like regular pasta, and mild enough to take on any flavor you put it with. I could see also doing this with mushrooms, pine nuts, or pretty much whatever you have on hand, with a butter/onion sauce like I did. SO good!